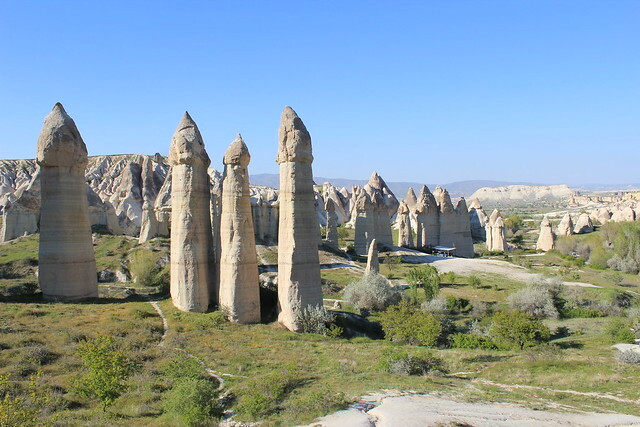 I’ve written previously on this blog about a few of my favourite sights, sounds, and flavours of Istanbul, about the bizarre landscapes and ancient ruins of Pamukkale, and about my three-day exploration of Cappadocia’s strange and surreal valleys. However what I haven’t shared with you are the logistics and costs of completing an independently organised adventure that introduces you to all of these sights. 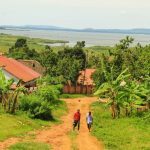 All three destinations are unique and very different from each other, and visiting them all will give you a good taste of the diversity that this fascinating country has to offer. 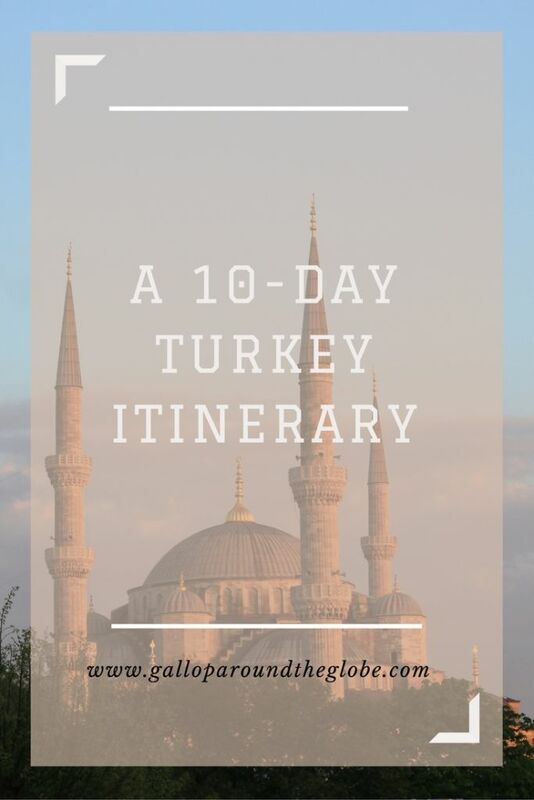 So, without further ado, here is my suggested 10-day Turkey itinerary. 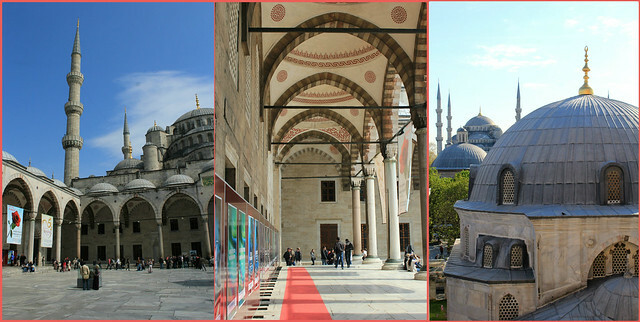 Start your trip in the beautiful city of Istanbul. We flew from the UK to Istanbul with Turkish Airlines (using Skyscanner), and queued up to get our visa on arrival at the airport (€15 at the time, not payable in Turkish lira). Now you’ll need to apply for an e-visa before arriving, which you can do here. The cost is $20 (around £15). 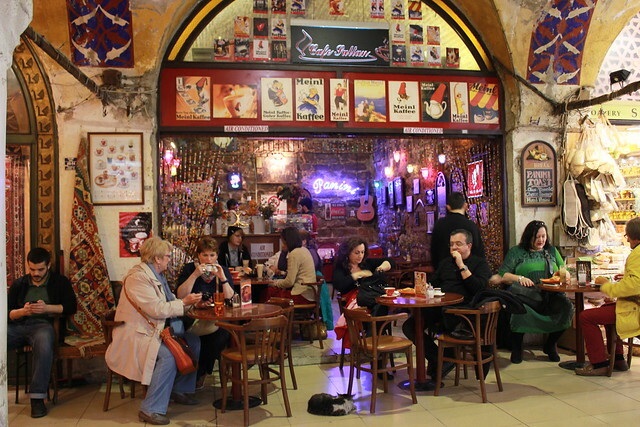 If you’re staying in Sultanahmet (the heart of historic Old Istanbul, and your best base for sightseeing in the city), you’ll need to take the subway (M1A) to Zeytinburnu. From there catch the tram (T1) headed for Sultanahmet and get off at Gülhane. 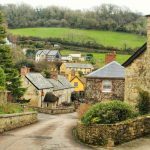 It’s an easy walk from there to most accommodation options in the area. 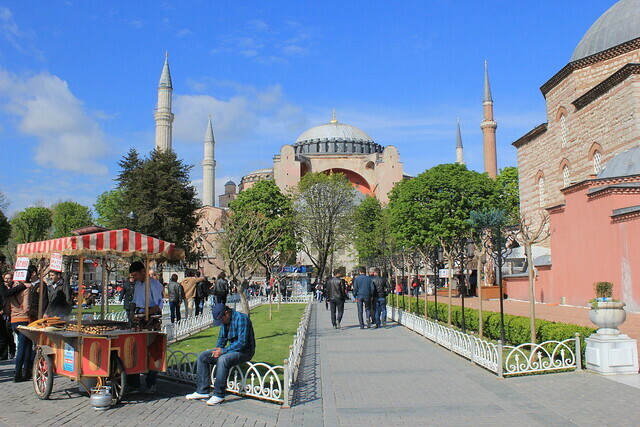 We chose to stay at Cheers Hostel, a small, friendly hostel that offers an inclusive breakfast every morning, a great little rooftop bar, and fantastic views of the Aya Sofya mosque, just around the corner. 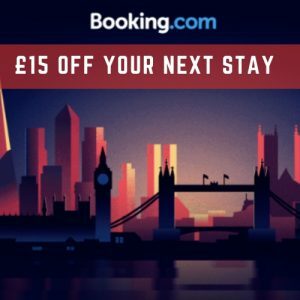 We paid €90 (£77.48) for two of us for three nights. 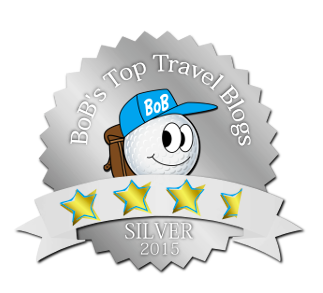 Click here to read my review on Trip Advisor. Helpful tip: Get yourself an Istanbulkart (travel card) at the airport. It works much like the Oyster Card in London: you pay a deposit for the card, you can top it up in 5TL increments, and you just have to swipe the card every time you enter a station. However unlike the Oyster Card, this one can be used for more than one traveller; it just deducts a flat-rate of 1.75TL per person, per journey. For this reason it’s not really worth using if you’re only travelling two stops (and to be honest, two stops on the tram is not that far and the walk is often much more enjoyable), but for longer journeys it can save you a hell of a lot of money. Incidentally these cards work on the buses, too. Commonly acknowledged as one of the world’s greatest buildings, the Aya Sofya (to give it its Turkish name; it’s also known by its Greek, “Hagia Sofia”) was built initially as a church in 537, converted to a mosque in 1453, and declared a museum by Ataturk in 1937. It’s an immense and beautiful structure, and definitely one not to miss. 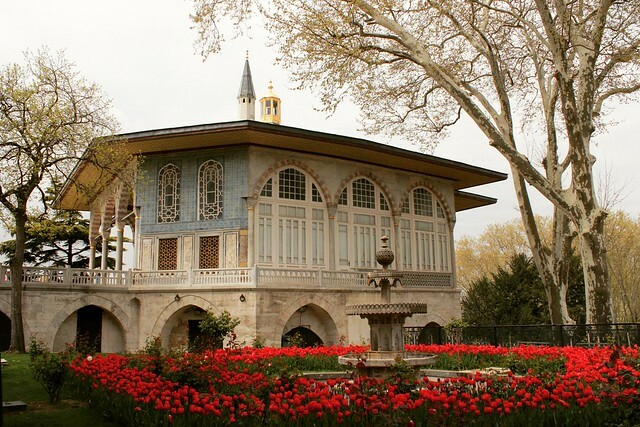 One of the largest and oldest palaces to survive to this day, Topkapı Palace was the court of the Ottoman Empire for over 400 years, between the 15th and 19th centuries, and has been a UNESCO World Heritage Site since 1985. It’s a grand, colourful, and fascinating site that oozes luxury from every corner, and was once home to as many as 4000 people, and contained mosques, a hospital, bakeries, and its very own Mint. 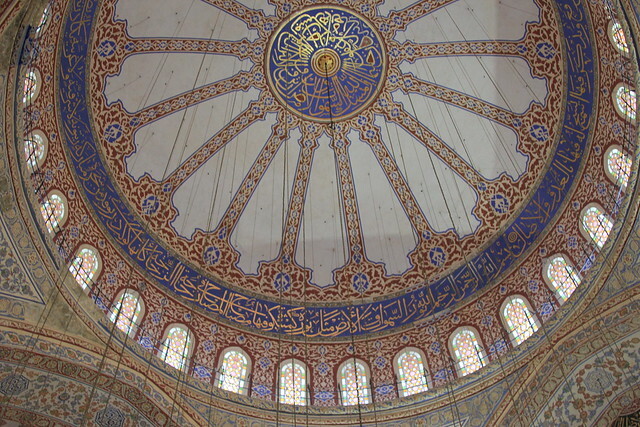 Besides being one of Istanbul’s most visited tourist attractions, the Blue Mosque is also an active mosque, so it’s closed to non-worshippers for half an hour or so during the five daily prayers. 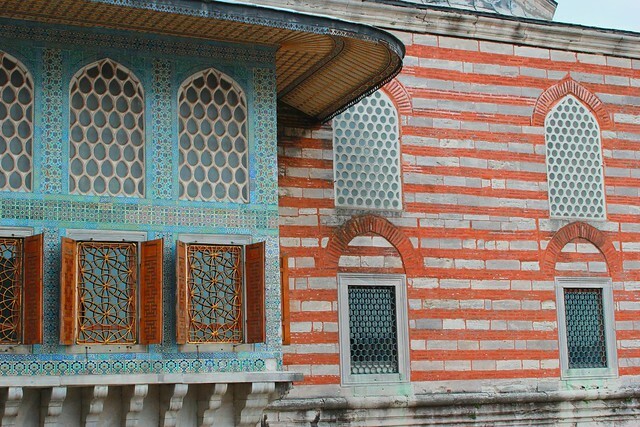 You’ll need a wide angle lens to photograph this building from its internal courtyard, but save some space on your memory card for some shots of the interior too; its walls and ceilings are adorned with thousands of beautiful blue Iznik tiles. 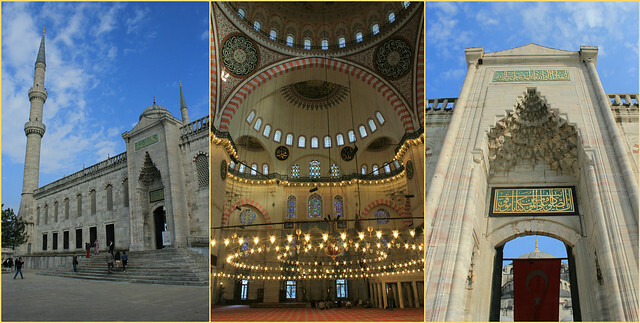 In my opinion Süleymaniye Mosque is one of the most stunning, and its location – perched atop Istanbul’s highest hill – means that it doesn’t see the same influx of visitors as its equally famous counterparts, Sultanahmet Camii and Aya Sofya. 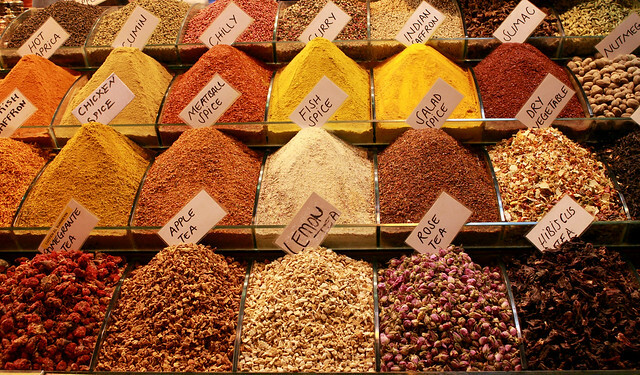 The Spice Bazaar is an Ottoman-era covered marketplace that – in its heyday – was the last stop for camel caravans (groups of people and camels who travelled in convoys over long distances) travelling the Silk Road trails from China, India, and Persia. Nowadays it’s a cacophony of colourful sights, rich, spicy aromas, and (if you have time to experience them) incredible flavours to boot. 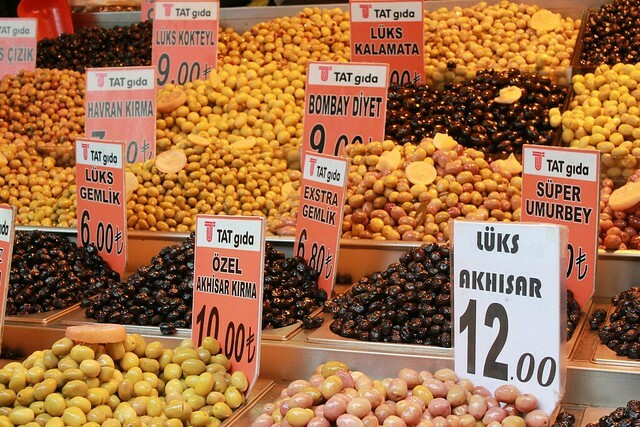 All manner of spices, herbs, loose and flowering teas, dried fruit and nuts, baklava, lokum (Turkish Delight), and cured meats, olives, and cheeses are for sale here. 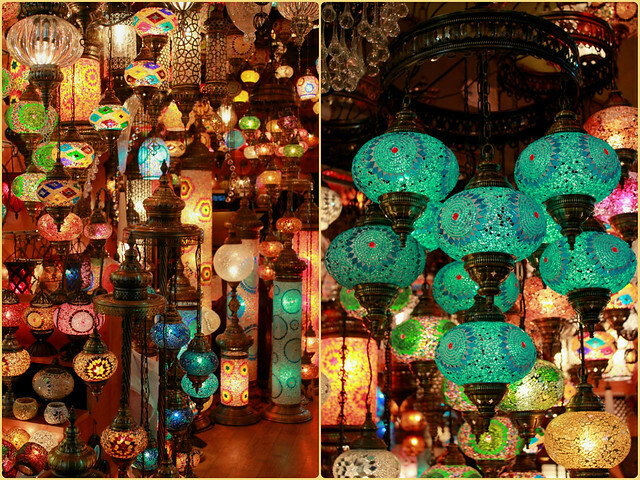 Constructed in 1461 as a small vaulted bedesten (warehouse), it has since spread into neighbouring streets, and now holds the title of Turkey’s Largest Covered Market. It’s not all about the shopping here (there are several cafes within the complex where locals come to socialise), but I guarantee that it’s impossible to visit and to not find something you’d like to buy. 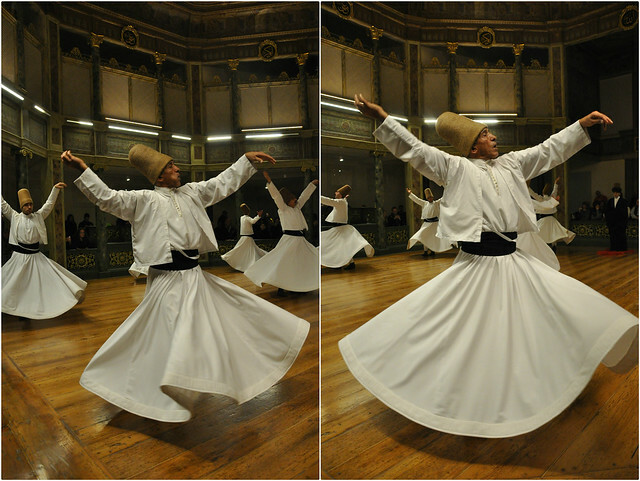 The traditional Sema Ceremony dates back 800 years, and is a ritual that is performed by Dervishes (people who follow a Sufi Muslim ascetic path) who spin themselves into a trance-like state in order to rid themselves of their egos and personal desires, and to bring them closer to God. 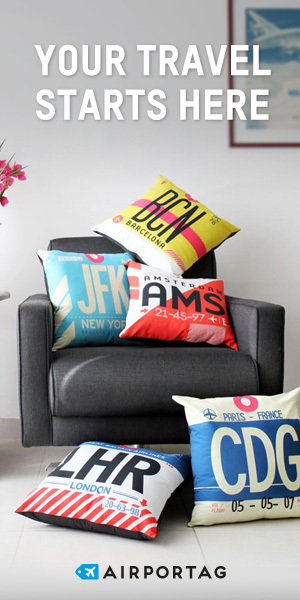 Photo courtesy of Flickr via their Creative Commons licence. These public performances are a method of preserving – and educating people about – an important part of Turkey’s heritage). Unusual as it is, the 60-minute show will leave you spellbound. 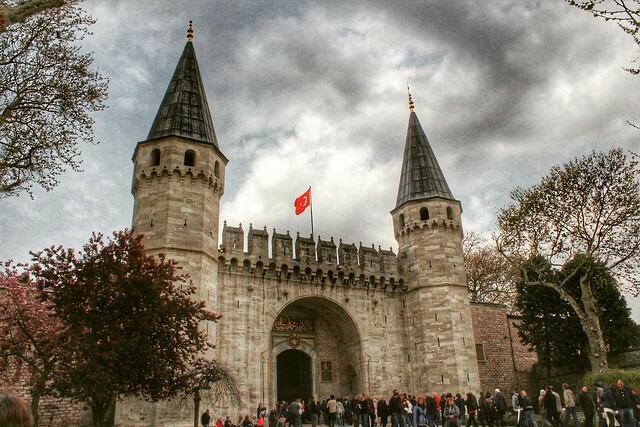 This nine-storey, 67-metre tall medieval stone tower is one of the most striking and recognisable landmarks in Istanbul. 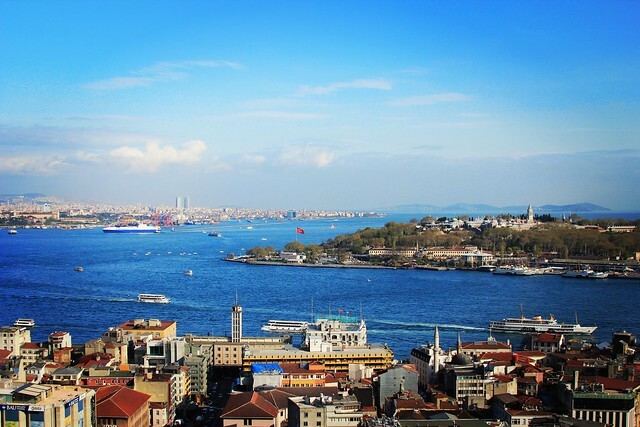 For some of the best views of the city (the others are from the grounds of Süleymaniye Mosque), make the climb up to Galata Tower’s upper balcony. There’s a cafe and restaurant up here too, although – understandably – the prices are hugely inflated. It’s kind of criminal to come to Turkey and not indulge in some traditional desserts and a cup of strong Turkish coffee to accompany them. And one of the most authentic places to try these is at Hafiz Mustafa. 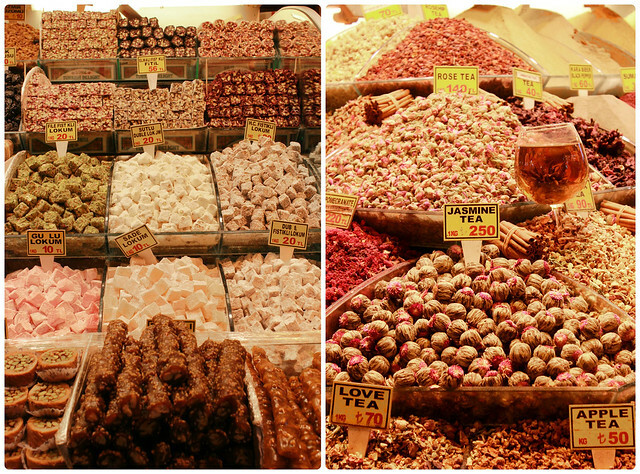 Established in 1864 it’s reportedly the oldest şekerlemeleri (sweet shop) in the city. 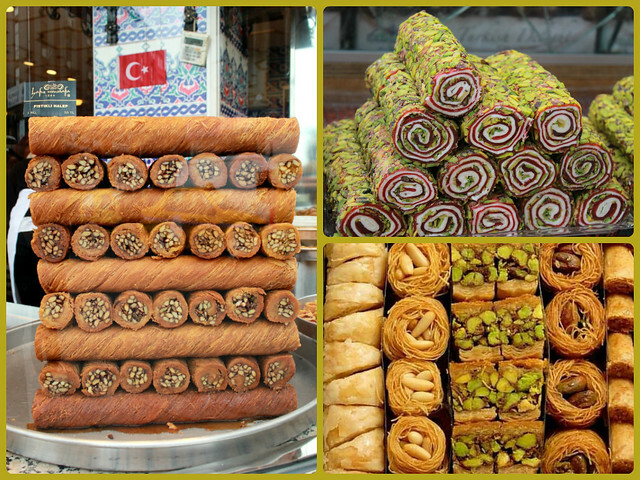 Their extensive menu of bite-sized desserts includes milk puddings, pastries, and borek. 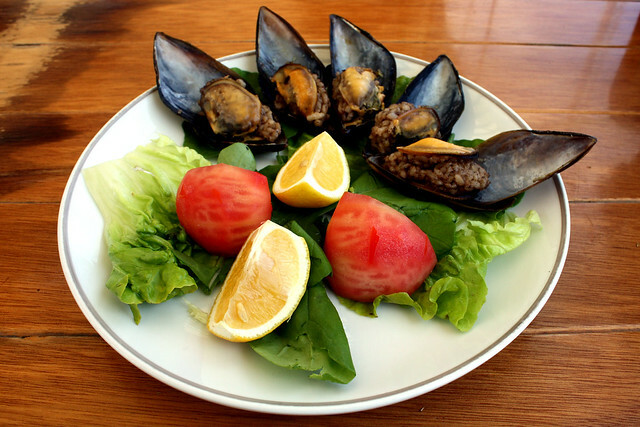 Istanbul’s street food scene is alive and kicking. You’ll find Simit (a freshly baked, molasses-dipped, and sesame-crusted bagel) carts scattered throughout the city, along with vendors selling Kestane Kebab (roasted sweet chestnuts), Balik Ekmek (freshly caught mackerel and salad in a white crusty baguette) and my all-time favourite, Midye Dolma – mussels on the half shell, mixed with spicy rice and a squeeze of lemon. 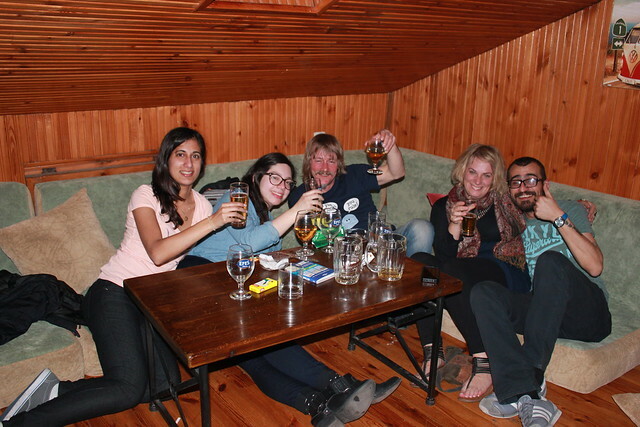 We caught the overnight bus to Denizli at 10pm bus from Istanbul’s Otogar (bus station). 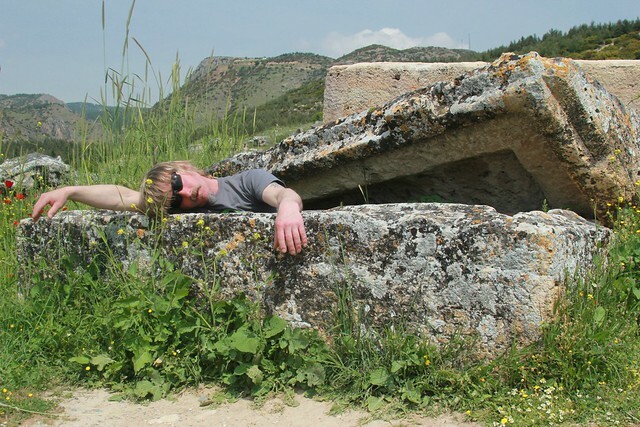 From Denizli we were ushered on to a minibus which took us into the centre of Pamukkale. When we arrived at our hotel, it seemed to embody everything that we’d found Pamukkale to be so far: a beautiful oasis of calm. We walked through the gates of the Melrose House Hotel into a lovely shaded seating area with marble floors, wicker tables and chairs, and traditional Turkish style lanterns hanging from its wooden ceilings. 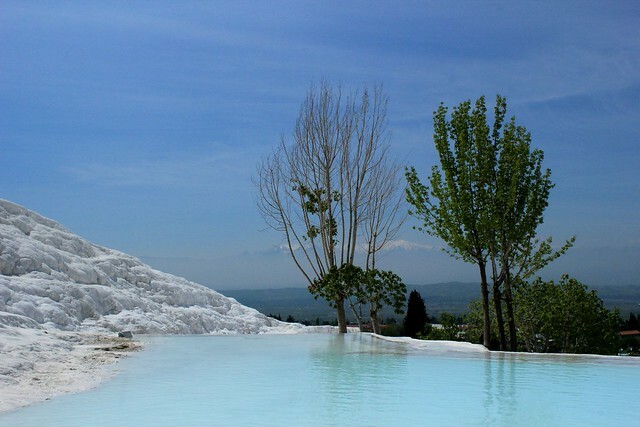 To the left was an inviting pool and garden, thoughtfully landscaped with plants and flowers, and backed by the beauty of Pamukkale’s countryside. It was a perfect base from which to explore the area. 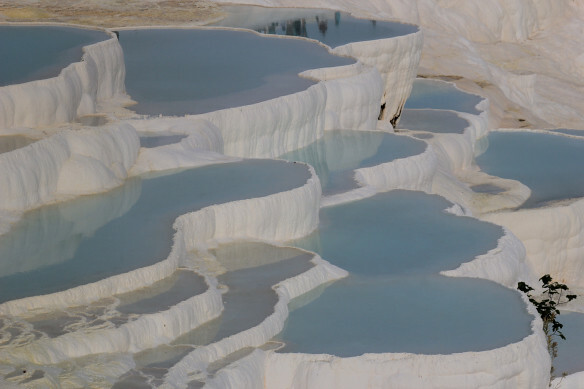 These travertines form a stunning backdrop to Pamukkale’s sleepy streets, like mountains covered in fresh snow. 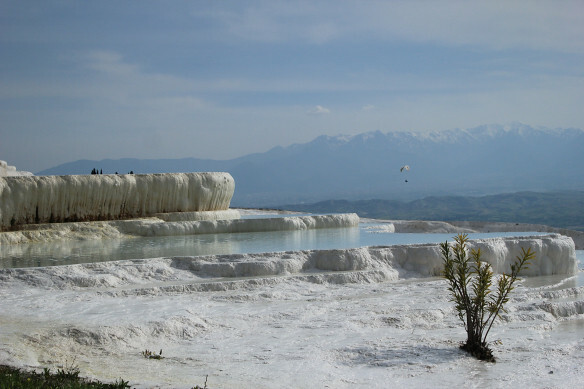 Located high above Pamukkale and on the same site as the village’s travertines and hot springs, Hierapolis (meaning ‘Sacred City’ in Greek) was founded as a thermal spa in the second century BCE, and subsequently became a healing centre where doctors used the thermal pools as a treatment for their patients. 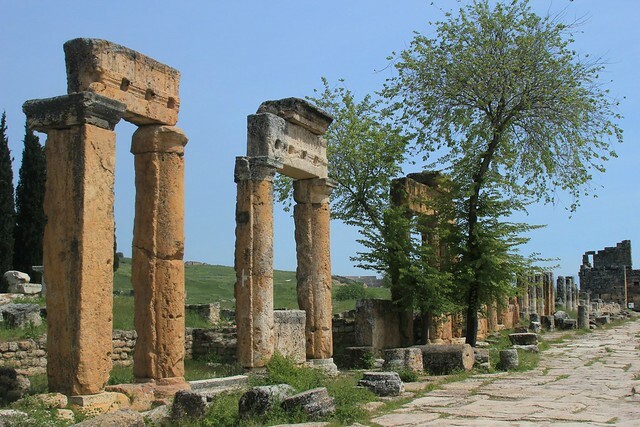 The ruins cover a vast area and include grand entrance gates, columned streets and baths, as well as a sacred pool, Basilica, Temple, Latrine, Amphitheatre, and a sprawling Necropolis. 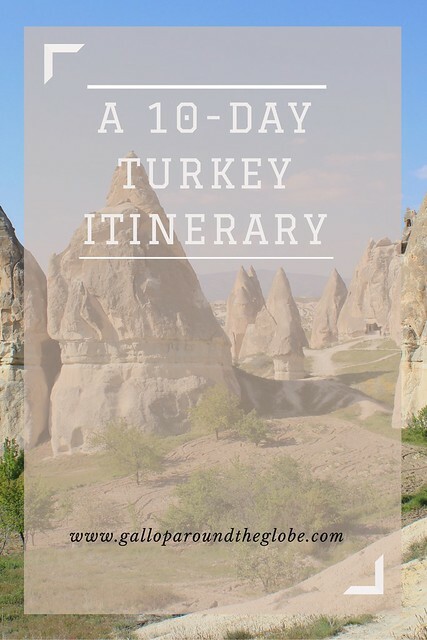 As our overnight bus pulled in to the cave-ridden town of Göreme at dawn, we were greeted with the sight of hundreds of colourful hot air balloons floating across the horizon. Cappadocia is one of the most popular destinations in the world to take a hot air balloon flight. The reason? 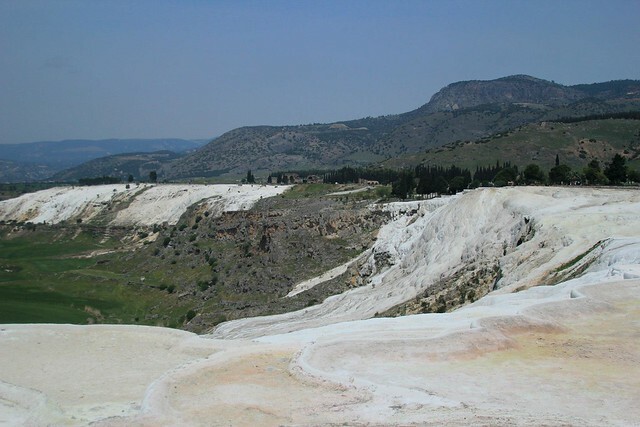 The region is home to one of the most surreal and spectacular landscapes in the world. 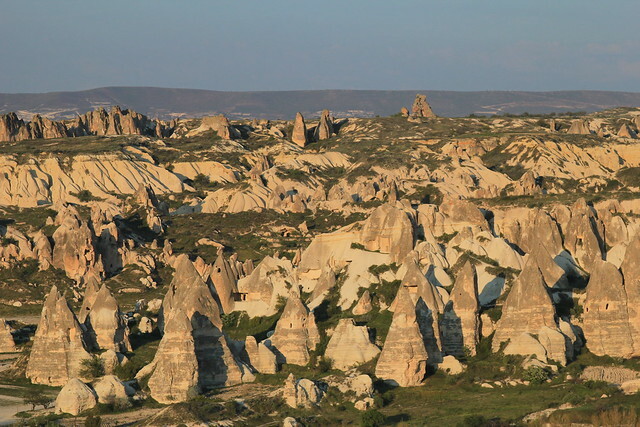 Thousands of years of erosion shaped the terrain and, taking a cue from Mother Nature, humans began carving a network of caves and tunnels into the soft rock, starting as early as the fourth century A.D.
Göreme National Park and the Rock Sites of Cappadocia were declared a World Heritage site by UNESCO in 1985 as a result of the ancient underground settlements and outstanding examples of Byzantine art that can be found there. 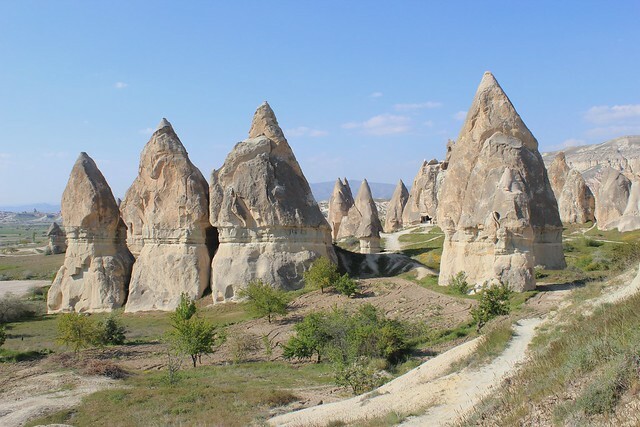 Don’t miss: Goreme Open Air Museum, Red Valley, Rose Valley, Pigeon Valley, White Valley, Love Valley, Uchisar Castle, The Green Tour with New Goreme Tours. Stay: at a cave hotel, in a cave. 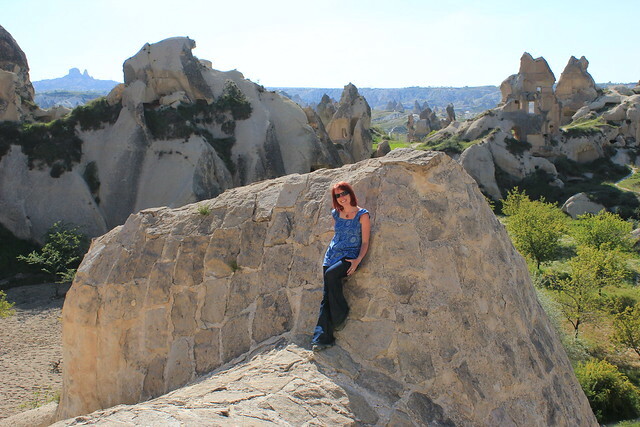 On our fourth day in Cappadocia, we chose to fly back to Istanbul from Kayseri airport (a minibus from Goreme takes between 1-2 hours), in order to avoid missing our flight back to the UK early the next day. We were able to spend our afternoon ticking off another of Istanbul’s famous sights: the Basilica Cistern. The subterranean structure was built in 532 and is largest surviving Byzantine cistern in İstanbul. 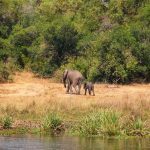 In order to help you organise your own trip, I’ve included a break down of the costs of this trip below. 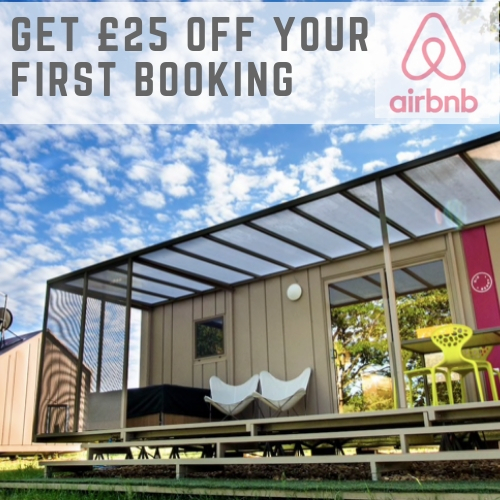 I’ve included all flight, accommodation and transport (between destinations) costs, but have excluded entry fees to sights and attractions and the price of any tours I’ve mentioned. All costs are per person (but there were two of us to split the accommodation costs between). To maximise your time in Cappadocia, it is possible to fly from Istanbul to Denizli and then from Denizli to Kayseri, but (considering that we saved on a night’s accommodation each time we took an overnight bus) it worked out cheaper for us to travel as we did, and I didn’t feel that our time in any of the three destinations was at all rushed as a result. So how would I describe Turkey? 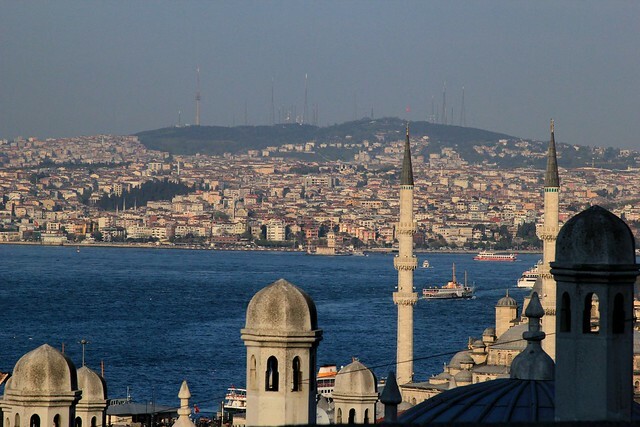 We had almost this exact itinerary when we traveled to Istanbul with the kids. What an amazing place. It had long been on my bucket list and it was even more amazing than I imagined. 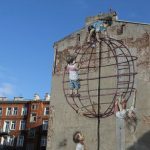 We loved the history, the art, and food and found the people to be some of the most welcoming we have ever encountered while traveling. It breaks my heart that things are uncertain there at the moment. I wish them peace so people can come back in flocks to visit. Did you visit recently or has it been a while? 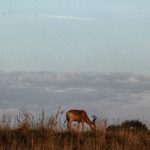 Would you recommend visiting it now, considering the current situation? 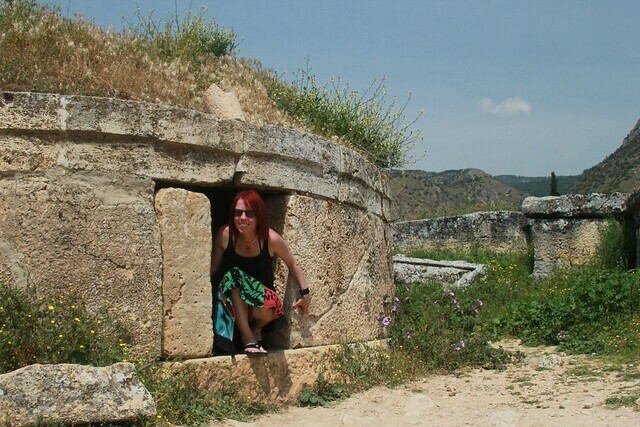 I visited a couple of years ago now, before all the recent conflicts began. 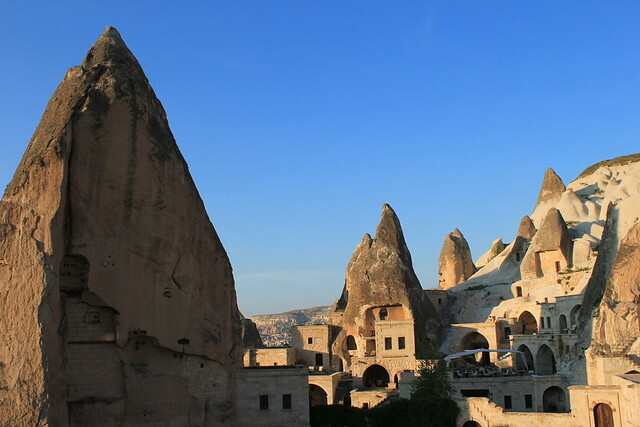 I’m not sure I’d feel comfortable visiting Istanbul currently (I know we shouldn’t let fear control us like that but it does, natural human instinct) but I think Cappadocia and Pamukkale would still be reasonably safe areas to travel through. Loved this post Kiara! I have always wanted to see the hot air balloons in Cappadocia but it also looks like an incredible place to spend some time exploring the history. Thanks Renee 🙂 Yes the hot air balloon flight in Cappadocia was definitely one of those totally unforgettable bucket-list moments. The only comparable place I can think of taking a balloon flight is over the temples of Bagan in Myanmar. 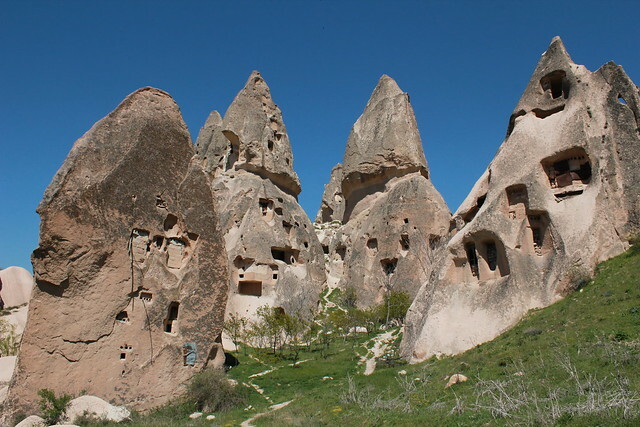 But, like you say, Cappadocia is just as fascinating to explore from the ground; the history of those caves and chapels dates back centuries!